Фотосъемка Игги Попа для дома Dior. Игги Поп снялся в рекламе дома Dior, спародировав самые распространенные штампы рекламной съемки фэшн-вещей. Официальный постер Каннского кинофестиваля этого года. На сайте также можно скачать постер в высоком разрешении. Explanation: How thin are the rings of Saturn? Brightness measurements from different angles have shown Saturn’s rings to be about one kilometer thick, making them many times thinner, in relative proportion, than a razor blade. This thinness sometimes appears in dramatic fashion during an image taken nearly along the ring plane. The robot Cassini spacecraft now orbiting Saturn has now captured another shot that dramatically highlights the ring’s thinness. The above image was taken in mid January in infrared and polarized light. Titan looms just over the thin rings, while dark ring shadows on Saturn show the Sun to be above the ring plane. Close inspection of the image will show the smaller moon Enceladus on the far right. Cassini, humanity’s first mission to orbit Saturn, currently has operations planned until 2017. 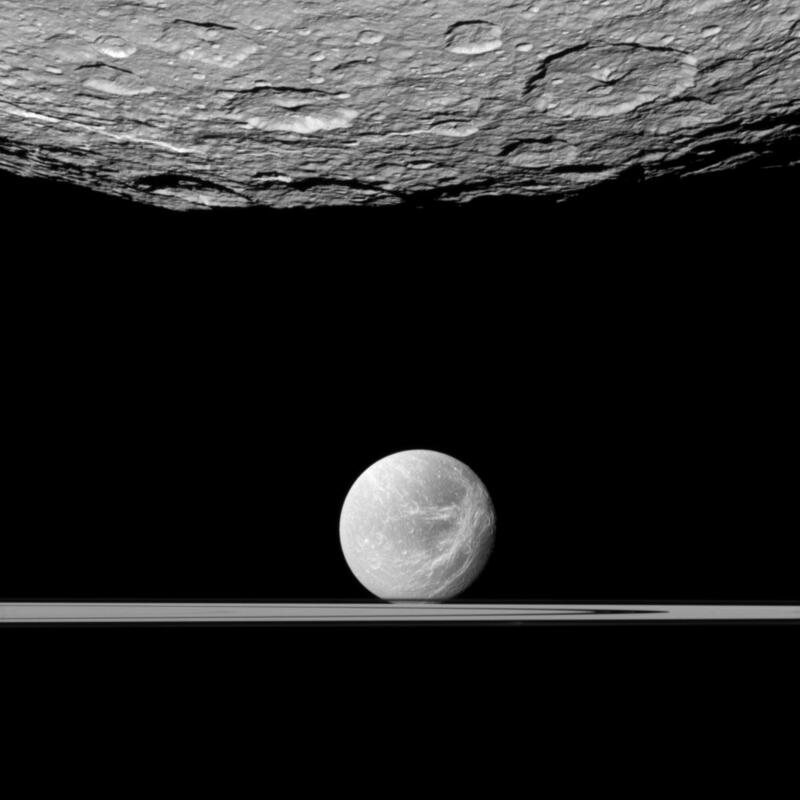 The Cassini spacecraft looks past the cratered south polar area of Saturn’s moon Rhea to spy the moon Dione and the planet’s rings in the distance. This view looks toward the south polar area of the anti-Saturn side of Rhea (1,528 kilometers, or 949 miles across) and the Saturn-facing side of Dione (1,123 kilometers, or 698 miles across). North on the moons is up.